Sunday’s weather was rainy/snowy/windy in our local area, but snowy/windy in Maine. On Monday, I jumped in my car to drive to Colby College for a presentation alongside Princeton’s Woodrow Wilson School. The eight inches of snow that fell on Sunday had mostly packed down or melted on the roadways and paths, but there was still plenty on the grassy areas. From Colby, we drove on to Bates College for an evening presentation. 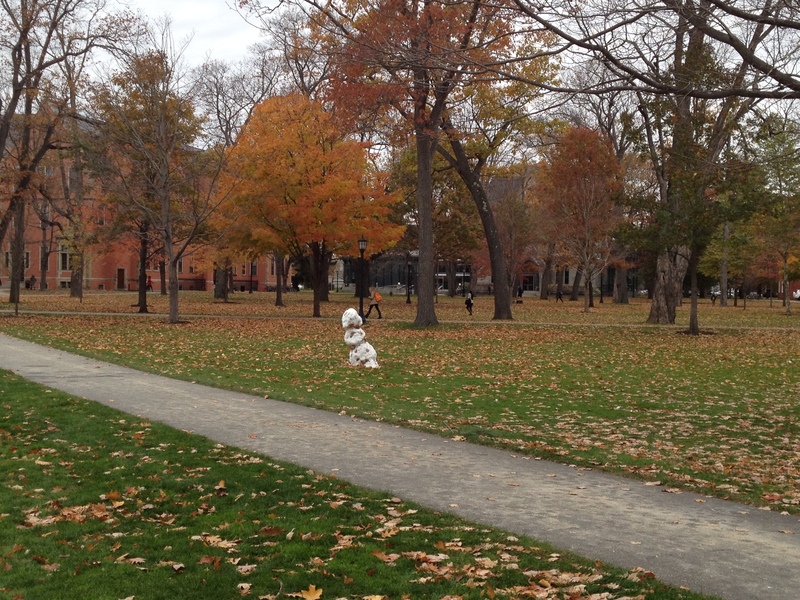 Yesterday found us at Bowdoin College, where a lone snowman punctuated the otherwise autumnal scene. I’m not usually the Fletcher rep who joins our peers out on the road, so this was a good opportunity for me to get to know John Templeton from Princeton, and to hear more about the program at WWS. And the career office staffs at the three colleges facilitated our conversations with engaged and interested future international affairs professionals. Today I’m back in town for a beautiful warm day, and I look forward to following up with students I met on my quick road trip.